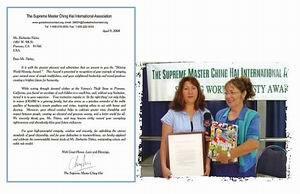 On May 18, Golden Year 5 (2008), our Association members presented the Shining World Honesty Award to Mrs. Barbarita Núñez on behalf of Supreme Master Ching Hai. Mrs. Núñez works very hard to support her three children and husband, who is currently unemployed. 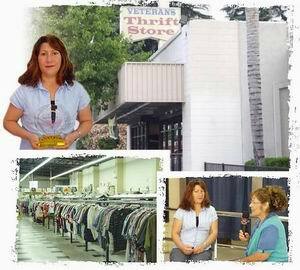 She is also a pure-hearted, noble lady, because when she found US$30,000 cash while at work at the Veteran's Thrift Store, she immediately called her supervisor to report the incident for the money to be returned. The Award ceremony was held in the store in the presence of her co-workers. When Mrs. Núñez was given the Award plaque, she exclaimed with great emotion, "What an honor, so beautiful, with so many hearts full of love!" She was also very grateful to receive Master's letter and some of Master's publications as gifts. Thank you, Mrs. Núñez, for being a model of honesty, uplifting our world with such a noble standard!